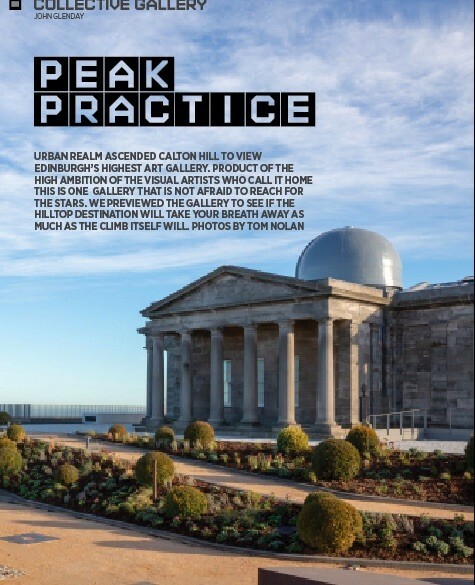 Edinburgh’s City Observatory has embraced the high life with an unmissable hilltop arts venue following restoration of the A-listed William Playfair designed astronomy centre. Disused since 2009 the romantic hilltop complex has been transformed into a lofty exhibition space, offices, a restaurant and shop which weave together the best of art and architecture in a globally important setting. 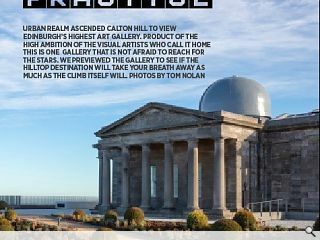 Visual arts organisation Collective have spent the past five years fundraising to make the £4.5m hilltop gallery a reality. by Collective Architecture (no relation) and Harrison Stevens landscape architects, providing a suitably dramatic backdrop for a series of exhibitions. 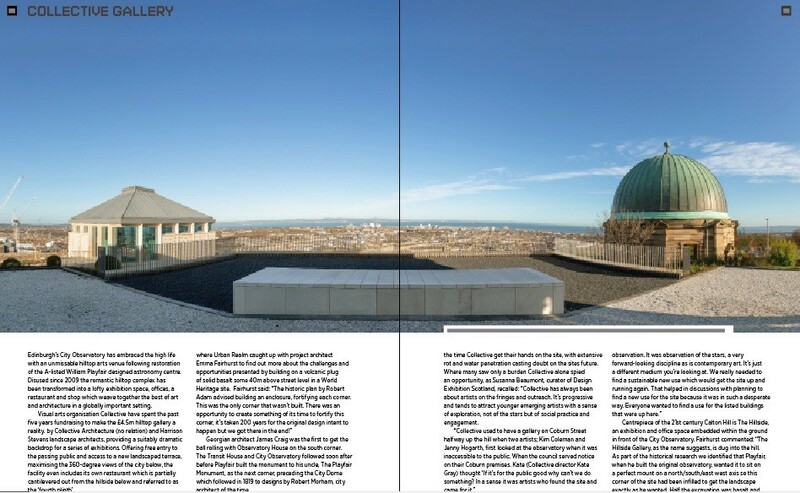 Offering free entry to the passing public and access to a new landscaped terrace, maximising the 360-degree views of the city below, the facility even includes its own restaurant which is partially cantilevered out from the hillside below and referred to as the ‘fourth plinth’. Georgian architect James Craig was the first to get the ball rolling with Observatory House on the south corner. The Transit House and City Observatory followed soon after before Playfair built the monument to his uncle, The Playfair Monument, as the next corner, preceding the City Dome which followed in 1819 to designs by Robert Morham, city architect of the time. These structures found themselves in a sorry state by the time Collective got their hands on the site, with extensive rot and water penetration casting doubt on the sites future. 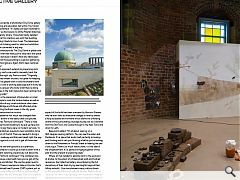 Where many saw only a burden Collective alone spied an opportunity, as Susanna Beaumont, curator of Design Exhibition Scotland, recalled: “Collective has always been about artists on the fringes and outreach. It’s progressive and tends to attract younger emerging artists with a sense of exploration, not of the stars but of social practice and engagement. 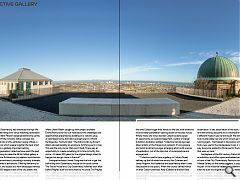 The Hillside is joined by a refurbished City Dome gallery space and a learning and education hall within The Transit House. Fairhurst remarked: “It’s really just been restored to its original layout, we had access to all the Playfair drawings stored in the university library. Those held really detailed information on what his intention was with that building. That helped to bring it back to how it was. The telescopes are still in there and its being used for retail and exhibition space, it’s not been converted in any way. One omission is the placement of binoculars or small telescopes for people to scan the horizon below as well as above but even without any visual assistance clear views toward the Forth Bridge and Fife are still afforded while a restaurant boasting the finest views in the city gives Collective some welcome extra income. Key to the project was the landscape work to the spaces between each pavilion, which now double as an outdoor sculpture park and outdoor gallery in its own right. 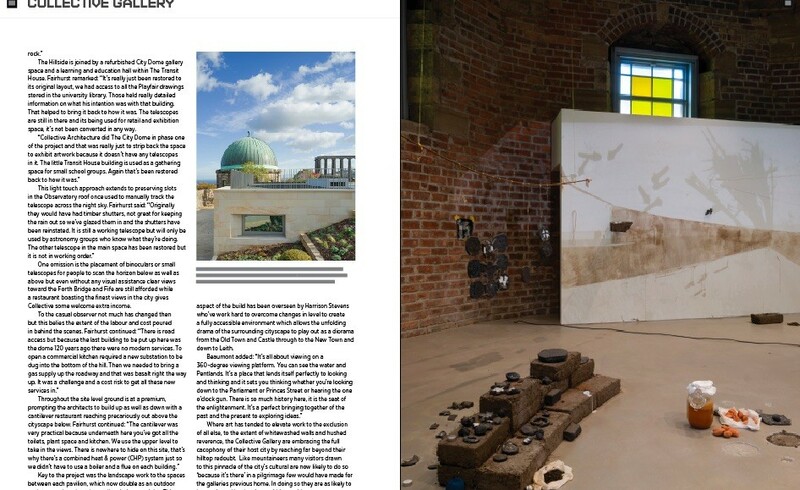 This aspect of the build has been overseen by Harrison Stevens who’ve work hard to overcome changes in level to create a fully accessible environment which allows the unfolding drama of the surrounding cityscape to play out as a diorama from the Old Town and Castle through to the New Town and down to Leith. Where art has tended to elevate work to the exclusion of all else, to the extent of whitewashed walls and hushed reverence, the Collective Gallery are embracing the full cacophony of their host city by reaching far beyond their hilltop redoubt. Like mountaineers many visitors drawn to this pinnacle of the city’s cultural are now likely to do so ‘because it’s there’ in a pilgrimage few would have made for the galleries previous home. In doing so they are as likely to be captivated by the views within as without.